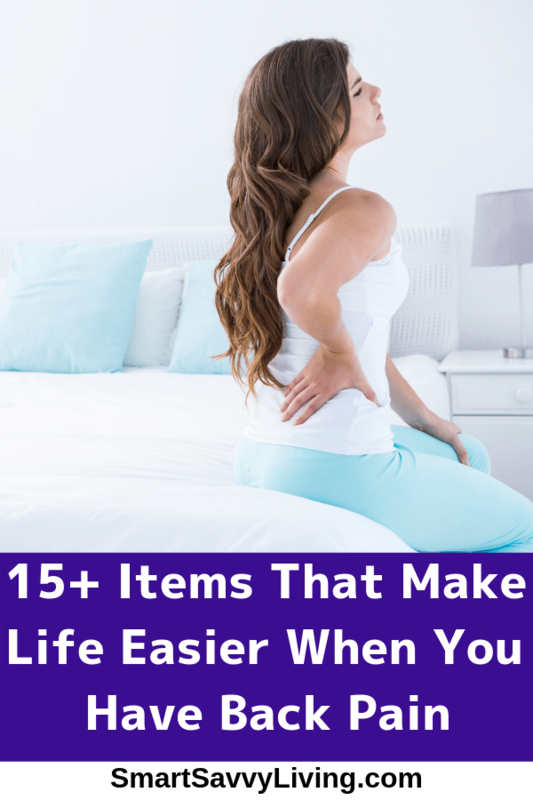 Do you have chronic back pain or had surgery and can’t bend over? These items that make life easier are super helpful! Being able to bend over to do everyday chores or to simply pick something off the floor is often taken for granted until you can’t anymore. I know that was definitely the case for me this year. I had an 82-pound giant ovarian cyst (follow the link if you’d like to read my story) that grew rapidly over a couple months and during that time it was super painful and uncomfortable to bend over and I had horrible back pain. Then I had major surgery to remove it which included an incision over a foot long and 63 staples on my abdomen. Needless to say, I haven’t been doing much bending over for a while which hasn’t made life so easy. I like being independent and sometimes you don’t always have the luxury of asking for help. When I got home from the hospital I knew I needed to take it easy but I also couldn’t wait to get back into my routine and get the house cleaned up from when I just didn’t feel like doing anything. I love Mr. Savvy to pieces and so very much appreciate everything he’s done the past few months but he just doesn’t clean like I’m used to. So, I’ve had a lot of experience with various products made to make life easier if you have back pain and/or can’t bend over. Today I’m sharing some of my favorites. Being just under 5’3″, I can also confirm a lot of these items help if you’re on the shorter side and often find that some things are difficult to reach. 1. Reacher Grabber Tool – This is quite possibly my favorite item on the whole list. If you’re on the short side it’s also super helpful to grab things off the top shelf. It became a real lifesaver when I could no longer bend over, though. I use it so much I even bought a second one to have one upstairs and the other downstairs. I’d definitely go for the 2-pack. I use my Reacher Grabber for all sorts of things like picking up clothes and shoes off the floor, anything I may have dropped, and even cat food dishes. 2. Extendable Scrubbers – Even though it’s been a couple months now since my surgery I still feel uncomfortable pressure and uneasiness if I bend over for an extended amount of time. However, some things like the shower, tub, and baseboards are tough to clean thoroughly when you’re not on their level. That’s why I love this extendable scrubber. It’s easy to use, doesn’t put a lot of pressure on my back or knees and cleans really well. 3. Telescoping Magnetic Pickup Tool – If you drop something like a screw or earring, it can be difficult to find even if you’re on your hands and knees. I find keeping a telescoping magnetic pickup tool around helpful for those situations as it also helps you find the item in addition to being easy to pick up. 4. Loofah Back Scrubber – After having surgery and losing such a large mass my body had grown used to carrying around, it took a bit of time for me to find my balance again. I also had to be careful to not get my staples too wet, and, again, couldn’t bend over. Having the long-handled loofah back scrubber helped me to be independent and still able to not only wash my back easily but also my lower legs and feet. 5. Raised Seat Cushions – I was honestly pretty weak after such a major surgery and required a few weeks of physical therapy. At the hospital, it was nice that the toilet and chairs were raised and easy to get out of. At home, that wasn’t such a luxury. Raised seat cushions and toilet seat raisers were helpful so that I wasn’t putting so much strain on my back and incision when getting up. 6. Sock Aid – Before surgery, my mass got so large I could barely reach my feet even sitting down. I know it sounds silly, but I really like being independent and it felt so frustrating to have to ask for help to do something as simple as putting socks on. Sock aids like this help so much to be able to put socks on yourself without bending. 7. Long Handled Shoe Horn – Just like with the socks, it can be frustrating to not be able to put your shoes on by yourself. When you’re recovering or have pain it’s usually a good idea to wear supportive shoes, which are usually tougher to put on than slip-ons. This long handled shoe horn helps a ton. No tie shoelaces are also a great idea. 8. Rolling Laundry Cart – Because I lost a lot of weight quickly, I’ve been slowly switching out my wardrobe. Between that and spending almost 2 weeks in the hospital we were quickly drowning in laundry. I wanted to be able to do as much as I could but picking up and carrying around a huge basket of laundry just wasn’t possible. I love this rolling laundry cart because you can not only go ahead and sort your laundry, but it rolls so no carrying and the bags are elevated so you don’t have to bend over so far. Using the reacher grabber from #1 helps to get the items at the bottom. 9. Heating Pad – Being in a lot of pain is no fun. If you’re like me, it puts a damper on your whole day and you don’t want to do anything other than curl up in a ball. I find using a heating pad really helps relieve my back pain at least long enough so I can get some of the chores of the day done. According to the type and location of your pain, you may also find a TENS unit helpful if your doctor approves. 10. Lightweight or Robot Vacuum – I’ve been wanting a robotic vacuum for years because, well, it does most of the work for you. Until then, I’ve been very happy with my lightweight Dyson stick vacuum. It’s so much easier to carry around since it’s cordless and a lot less bulky and heavy. 11. Steam Mop – I love steam mops because they’re very light and easily clean up even tough floor grime. For lighter messes, I like using a Swiffer mop. Either choice is certainly a lot less stressful on your back than having to constantly wring out a traditional mop. 12. Retractable Dusters – When you’re stuck at home during illness or recovery, it’s kind of hard to not have the time to notice all the random dust bunnies or cobwebs you haven’t gotten to. Luckily, with a retractable duster, you can get rid of them quickly and easily. 13. Soap Dispensing Brushes – As luck would have it before I had to go to the hospital the dishwasher broke. I’ve been washing the dishes as I can by hand but it’s no fun having to move the Costco-sized dish detergent around. It seems so simple but this soap dispensing dish brush is really handy. 14. Disposable Dishes – I’m all about using reusable items whenever possible to save both our environment and money. But, when you’re sick, in pain, and/or recovering, on top of your dishwasher being broken, sometimes you just need the break of disposable dishes and silverware. I do at least try to get paper products so they can at least break down over time. 15. Extendable Litter Scoop – I love our cats dearly. However having to bend over to scoop their litter boxes is no fun, nevertheless when you can’t bend over and have back pain. This extendable litter scoop has been such a life (and back) saver. I don’t have to bend over at all to use it and it’s still going strong after 3 years. I actually liked this telescoping litter scoop more overall in use, but it did get loose easily and ended up breaking under the weight of large pee pucks after about a year. 16. No Bend Pet Bowls – When you’re not supposed to bend over putting your pet’s dishes on the floor and picking them up can be a challenge. This is one thing I found the reacher grabber to be a bit challenging to use for, especially when putting a full bowl of water back down. These no bend pet bowls are ingenious. So many of these items have let me remain independent and keep my confidence while both ill and recovering. If you have another item you thought was super helpful while you were injured or recovering I’d love it if you’d share by leaving a comment below!